Emerald Ash Borer (EAB) is a jewel beetle native to north-eastern Asia that feeds on ash species. The insect is not considered in its native range to be noxious, but just a nuisance. Outside its native range, it is an invasive species and is highly destructive to ash trees native to northwest Europe and North America. Low temperature at the end of January this year (-14 Fahrenheit) led us to hope that the EAB was eradicated. But, alas, the temperature was not low enough nor long enough to kill the insect. 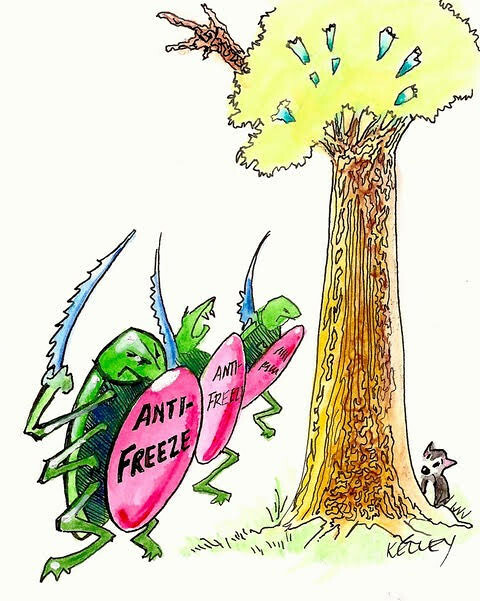 Beside, the insect is able to produce antifreeze chemicals. It appears that many more days of research are needed to control the EAB epidemic.